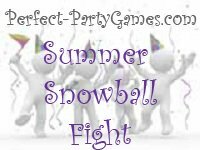 Summary: Summer Snowball Fight is a party game using flour instead of snow. 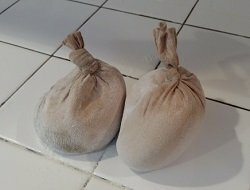 Start at the toe of a pair of pantyhose, fill with a half a cup of flour, tie a knot just above the flour, and cut. Tie a knot in the loose end and fill once more, continue making snowballs all the way up the leg. Each leg will make 5-6 “snowballs”. Make at least 2 snowballs for each player. Now is time for the snowball fight! Every player begins with two snowballs.Start by standing in a big circle, backs facing each other. The host yells "GO" and the fight begins. Everyone then throws their snowballs at each other. When a snowball lands on the ground, anyone can capture it and use it again and again. IMPORTANT: This game is light-hearted. It is best if you make the rule that everyone throws underhanded. Hard throws are not allowed. The host will need to judge who has the least amount of flour on them and declare that player the winner. Use knee high nylons and put one whole cup of flour in each. Tie a knot near the flour. Each player only gets one snowball and must keep it with them at all times. The snowball is then used to "hit" the other players. The winner is determined the same way. This game is also fun played wet. That way, more flour sticks to the players!